Cycling along the South Bank's car-free riverside route is part of my regular commute, and it has become one of my favourite parts of town. It is remarkable how its character changes over a relatively short distance. The end-of-the-pier full-on tourist vibe around the London Eye is in stark contrast to the quiet pedestrian ambience of the Albert Embankment path south of Westminster Bridge just a minute away. 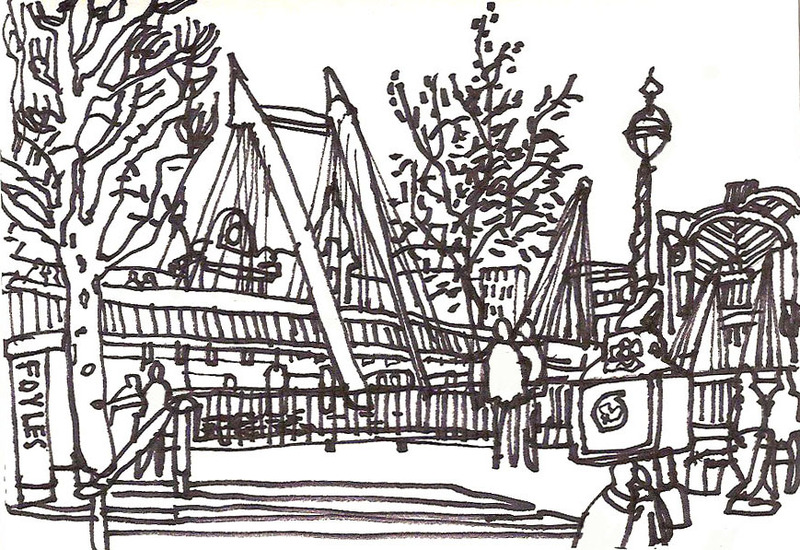 This drawing of the view towards Hungerford Bridge was done from the low vantage point of a cafe underneath the Royal Festival Hall. The people there seem to be waiting to go into a concert or film, or relaxing before heading home from Waterloo Station. On rainy mornings, the raucous South American-sounding buskers on the bridge have often cheered me up as I cycle by. On a sunny summer's evening, it's unbeatable here. There's more at www.james-hobbs.blogspot.com, or follow me at @jameshobbsart. 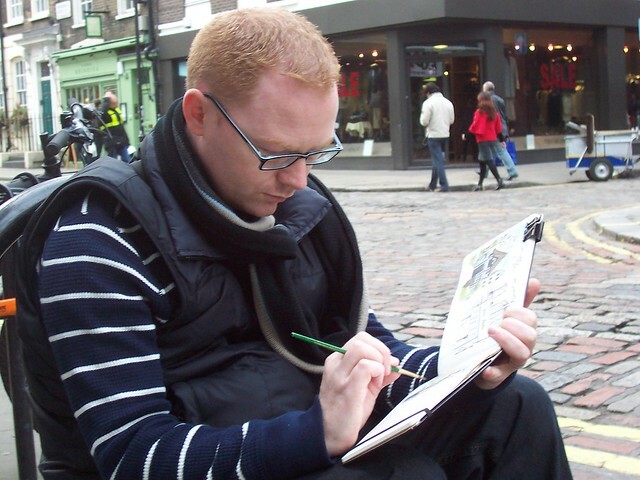 Hello, my name is Pete Scully and I will be an occasional guest correspondent on Urban Sketchers London. 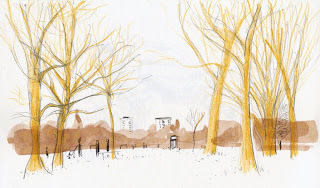 I'm very excited there is finally an USk blog devoted to London! I am a born and bred Londoner, from Burnt Oak on the Northern Line, but since 2005 I have been living on the other side of the world in Davis, California. There, the Sun may shine brighter and people may be cheerful, but London will always be my home city. 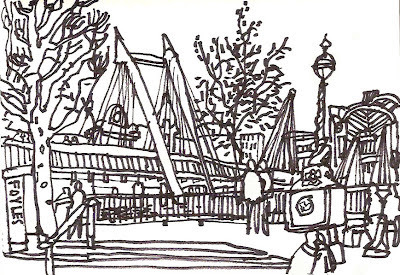 I have been the Davis, CA correspondent on the Urban Sketchers site since its launch in 2008, and I come back to London every so often to see my family and friends. 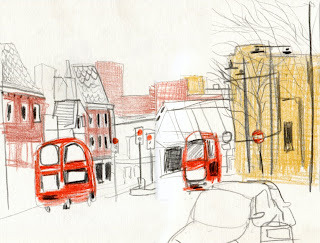 I always do as much drawing as I can, as if I am trying to take bits of old London back to America with me. I primarily use pen (Micron Pigma, various Uniballs, Copic multiliners) and watercolours (Winsor & Newton Cotman) and a watercolour Moleskine. 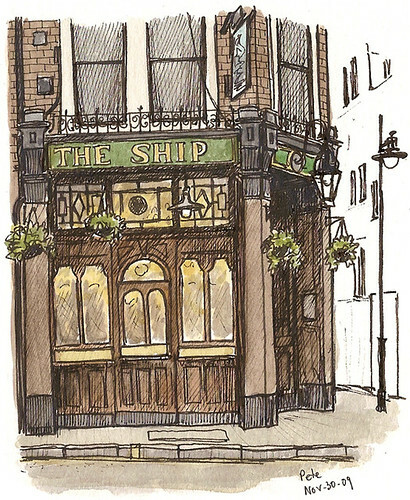 I most like to draw urban details and urban furniture, but am really drawn to the warmth and texture of London's old pubs. 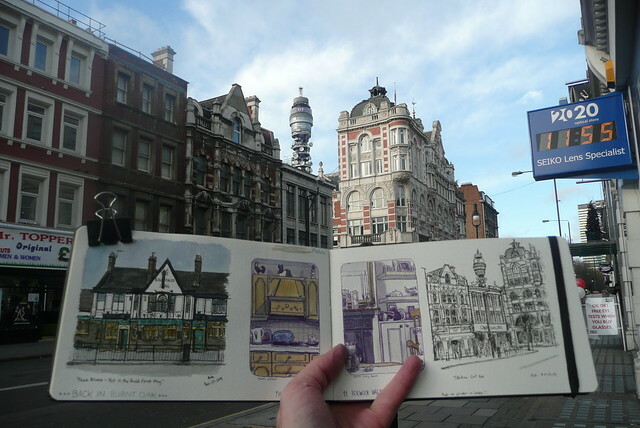 The area of London I most prefer sketching is Soho, full of character and personal history, constantly evolving. 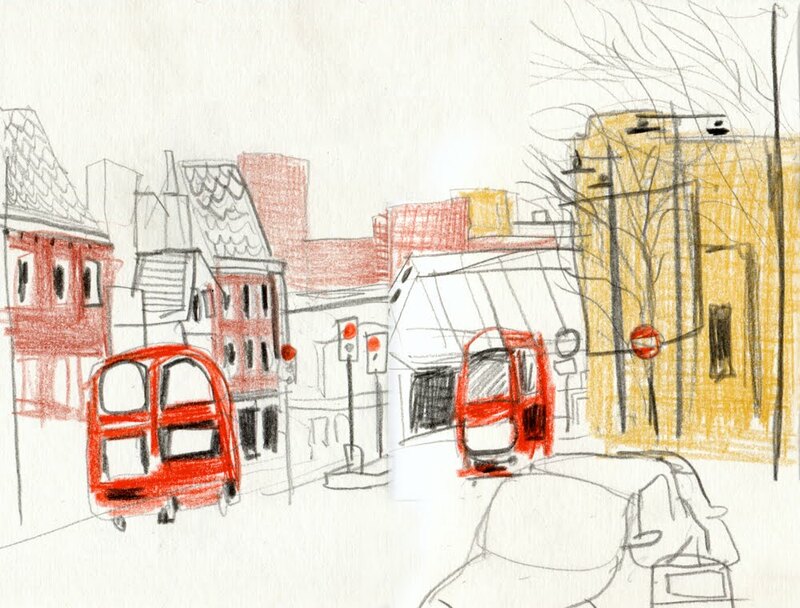 Years ago, I used to be a tour guide on an open-top bus around London, and I have illustrated a guide book called "London Walks, London Stories". 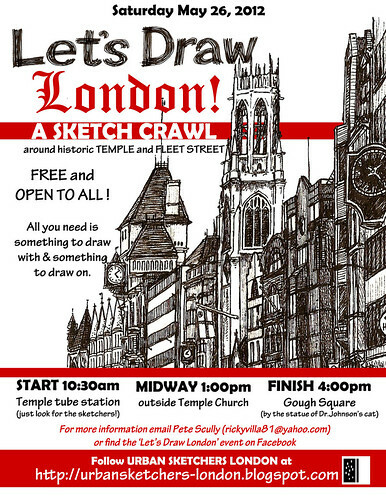 I will be next in London in May, and am organizing a sketchcrawl around the Temple and Fleet Street areas on Saturday May 26. 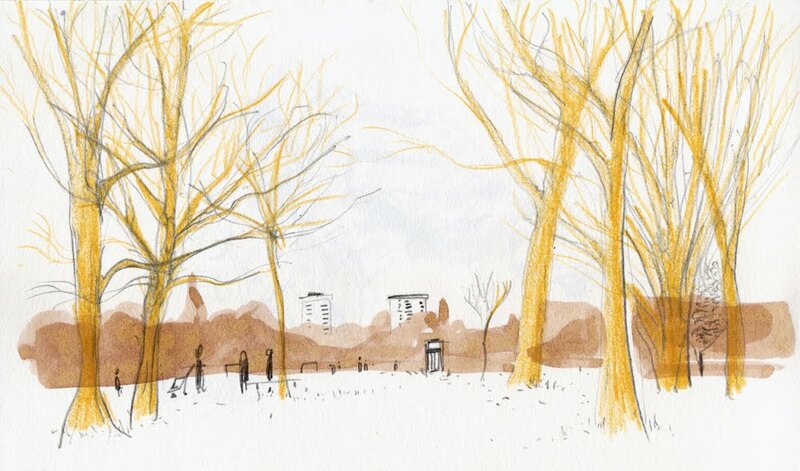 We'll meet at 10:30am outside Temple tube station, and sketch all day until 4:00pm, when we'll reconvene at Gough Square off of Fleet Street to look at each others' sketchbooks. Why not come and join us! 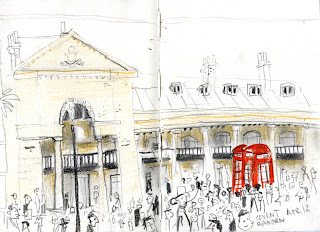 See my sketchblog, my flickr and my posts on Urban Sketchers. One of the things I like to do is to find places in London where it's easy to practice life drawing ie sketching people - without having to pay the life models! It's also a great way of getting people doing things naturally rather than those funny poses that life models like to strike at times! 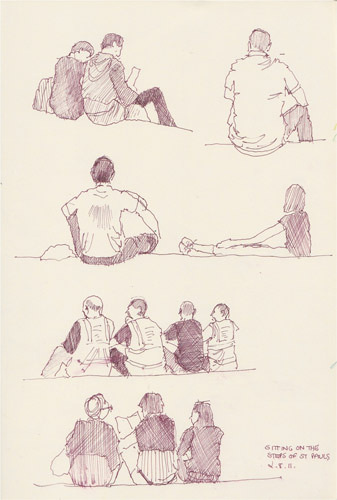 The best way that I've found of finding people to draw is to sit somewhere that people tend to congregate and wait a while. There's quite a few of those in London. One of the best places to find people sitting and taking a "time out" is on the steps in front of St Paul's Cathedral. 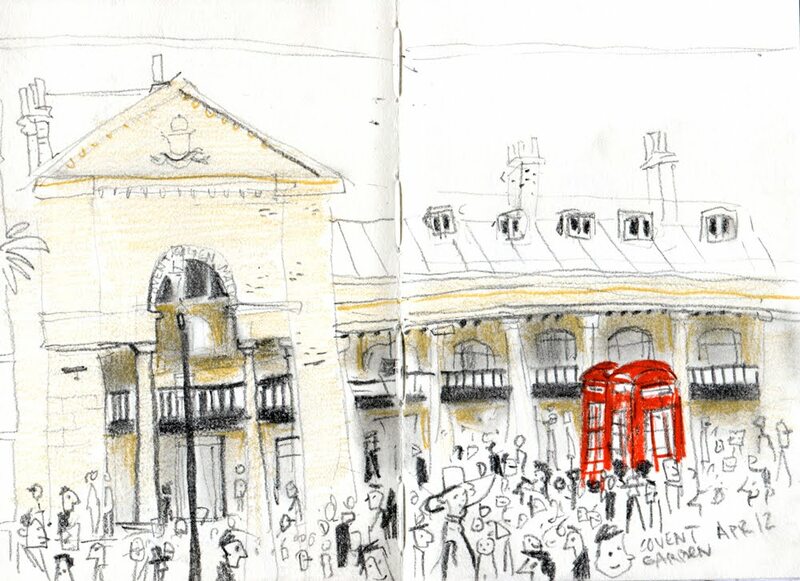 Here's my sketch of people sat on the steps and done while I was sat at the top of the steps waiting for fellow Urban Sketcher Liz Steel (Liz and Borromini - from Sydney Australia). 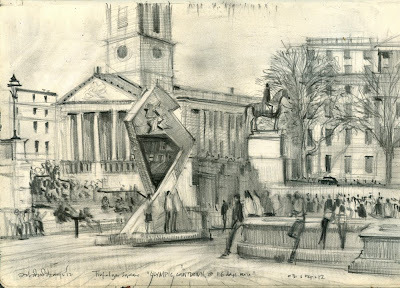 Did I tell you how Urban Sketchers is also a great way to meet other sketchers from all over the world? 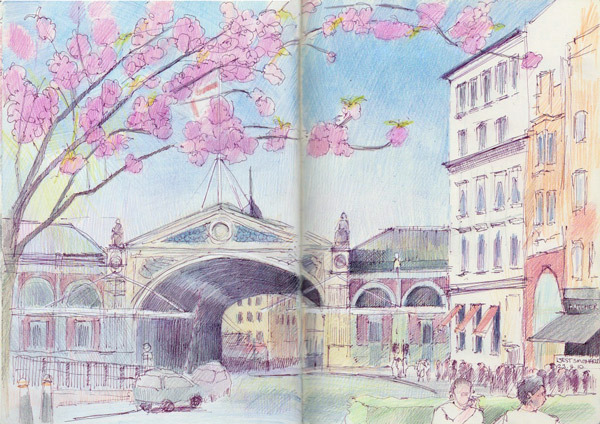 I've just returned to London and seeing all the cherry blossom everywhere reminds me very much of a pleasant hour or so sat sketching this sunny scene in West Smithfield in April two years ago. You can thank the Japanese Ukiyo-e artists Hokusai and Hiroshige for reminding me of the strength of designs in their pictures of cherry trees and that you can have a tree trunk which is barely in the picture plane! My blog post then The Courtauld, Old Bank of England and West Smithfield tells you about the very considerable history behind this place and its connections with both Wat Tayler and William Wallace. All of them are very quick, done almost on the run. Yesterday I went to Mall Galleries for the ROI Annual General Meeting and also used the opportunity to view the Lynn Stainer Painters Exhibition. While on my way back to Charing Cross Station I decided to stop and sketch the Official Countdown Timer for The Olympics at Trafalgar Square. I sketched it while it was 116 days to go, I hope to sketch it again when it's only a day or 2 to go, if I am chanced. I sketched this in my A4 Moleskin Sketchbook with a 2B Chunky graphite stick, a 2H pencil and a 0.7 mechanical clutch pencil.